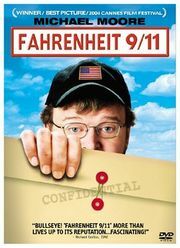 This was Michael Moore’s first film that I did not like too much. Watching it again today confirms my impression that making the film was rather driven by the urge of making a film about what was called the War on Terror rather than having something specific to make a film about. Moore picks up some aspects here and there, some are more convincing, some less. I am not sure whether he wants this to happen, but one of his main characters, an excessively patriotic woman who takes pride in raising the flag every morning and having had half of her family in one war or the other, is the most worst witness of the prosecution against an illegitimate war. She only starts re-considering her opinion about the war when her own child gets killed in Iraq, never flinched when others got killed. All she has to offer is the mourning about this child, she never understands the larger point of wars maybe being questionable in principle and takes this whole thing as a completely self-centered effort of somehow coping with this single death, not giving a damn about all the others, especially on the Iraqi side. Maybe the most terrible person I have ever seen depicted in a documentary. Then there are nice Moore moments where he tries to convince congressmen into enlisting their own children for a war they have confirmed. There are interviews with US soldiers in Iraq explaining how you best get pumped up for combat by attaching a nice rock CD to the intercom system. Pictures of wounded and dead, of children playing and women crying. The images are powerful, but they have to be interpreted as a provocation, because hardly ever is there a balanced “documentary” approach to the editing, the film is more a provocative and angry op-ed, exaggerating the visual means to get a point across. That point is understood, and probably even accepted these days in most parts of the world, but when you watch Fahrenheit 9-11 today, it seems like a lot of visual and narrative effort to get that message across. Still an interesting watch today.